People in Yemen are sharing photos on social media of themselves with one eye closed in solidarity with a young girl injured and orphaned in an air strike. Bouthaina al-Rimi's home in the Attan neighbourhood of Sanaa, the capital of Yemen, was bombed and destroyed on 25 August. The blast killed her parents and six siblings. Following her rescue, a photographer shared a picture of Bouthaina trying to open one of her swollen and bruised eyes. The picture has become an emblem for the toll the war in the Middle Eastern country is taking on its population. Since 2015, Saudi-led forces have been fighting Houthi rebels, who control northern Yemen including Sanaa. 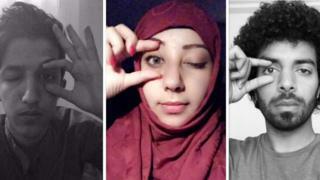 By sharing photos of themselves closing an eye, people in Yemen are hoping to raise awareness of the crisis. Half a million children under five are suffering severe acute malnutrition, and the cholera outbreak is the largest in the world, infecting over 500,00 people. The Arabic hashtag #Bouthaina_The_Eye_Of_Humanity and #I_SPEAK_FOR_BUTHINA have both been used more than 3,000 times since Wednesday. Prominent Yemini blogger Ezzedine Aref shared a photo, writing 'Solidarity with Buthaina, the only survivor of the bombing in Sanna last week'. Wiam Adil Maktari shared her photograph on Facebook, which elicited nearly 400 reactions. "Bouthaina is telling the world 'open your eyes'," wrote film-maker Abdulrahman Algamily from Istanbul, Turkey. "O my little one, no matter how much you try to open your eyes, the world is, unfortunately, a dark place," he continued. BBC's Nawal Al-maghafi, who has gained rare access to rebel-held Yemen in the past months, posted her own photograph with the hashtag. Some Twitter uses called for an end to the war. "For Bouthaina and all of Yemen's children, we say YES to the end of war," @bn_sawlan commented. Reporting by Alma Hassoun, BBC Monitoring, written by Georgina Rannard, BBC UGC & Social News.